We have a number of railway vehicles parked on tracks adjacent to the Main Platform at Totnes Riverside. Some of these are owned by individual members, the Totnes Riverside Group, and other groups of members. 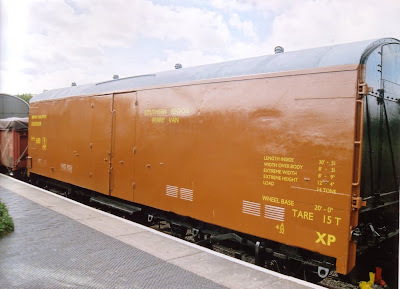 As with all railway vehicles fitted with wheels, these are subject to be moved from time to time, and may not always be available for viewing on a specific day. 12 Ton Box Van. This is the Totnes Group Mess Van. No. 766153. 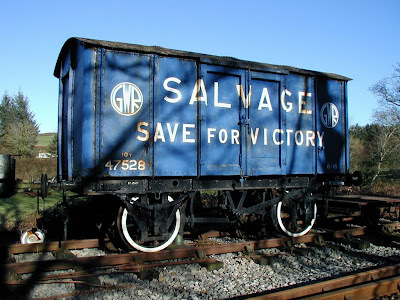 It arrived at the South Devon Railway approx. 1996, having been previously used as a Stores Van for the Weighbridge Specialists Pooley & Son. The Monster. This vehicle houses a working model which includes Thomas, Toby, Stepney, Annie and Clarabel. The model is operated on a time switch, and generates an income for the Totnes Riverside Station Group through the donation tin in front of the model. The Monster also houses a vast amount of books and magazines for a wide variety of interests - mostly donated by our supporters - and these are available for purchase by suggested donations. The vehicle is said to have been used in WW2 as a mobile headquarters for General Eisenhower. Arrived on the SDR in January 1999. No. 594. Built 1918. There is an article in Bulliver 143 giving a brief history of the vehicle. Owner: Paddy Goss. Two CCT vehicles (joined by a Euro Tunnel style coupling). Built in 1957. One is used as workshop for the Totnes Riverside Group, while the other is providing workshop facilities for the Signal and Telegraph Group working on the Ashburton Junction Signal Box. Nos. 889009 and 889015. BR Ferry Wagons. Their history describes them as Motor Vans, used as Barrier Vehicles. They were part of a fleet of vehicles and engines sent to be displayed at the IVA88 Exhibition in Hamburg. They are fitted with BSI couplers. They arrived on the South Devon Railway, by road, in December 2004. National Coal Board Tar Tanker. GWR No.7303. 15cwt Crane. Was housed in a protective tent while being repaired by the Totnes Riverside Group. It is now on display behind the station. No. 610 GWR Hand Crane. 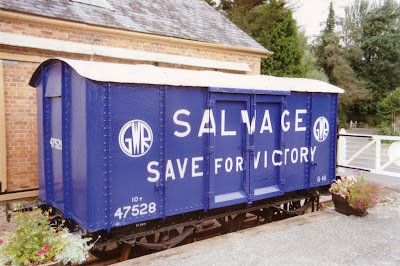 The restoration of this vehicle is now complete, and it is suggested that it be entered into the Heritage Railway Association 2013 Competition. Unfortunately it did not win on this occasion, but further entry in the future is being contemplated. Above: Pictured in September 2012. Chassis of a 5 plank wagon. No. 61063. No picture available at present. Iron Mink. GWR Iron Mink No. 47528 or 59119. This vehicle is currently the latest one to receive the attention of the younger members of the Totnes Group. It is expected to be a very long term project. Most of the steel panels will need to be replaced, and therefore there will be considerable calls on the SDRA Historic Vehicles funds - raised previously by proceeds from the Annual Draw. It is currently housed in a tented area behind the station. Mica B. No picture available at present. Last weekend Allan Lovegrove and 2 other members drove to Reading to collect a donation from a friend of a member. This is the chimney from a GWR Castle Class loco - believed to be 5018 St Mawes Castle. It has a Batch or Casting number of B2119 - if anyone can help to identify please let us know. We intend to refurbish it and display it in some fashion on the station. Don't ask me why the photo keeps turning through 90 degrees!